Last week marked the third appearance of Clean Cut at Sydney's premier fashion event - Mercedes Benz Fashion Week. Unlike CC's inaugural appearance, when I helped launch the company and we hosted a sustainable fashion runway, I had the pleasure of simply being a guest at this year's panel discussion/seminar. The Future Talks 2 panel was hosted by the charming Kellie Hush, Editor of Harper's BAZAAR Australia, and featured representatives from Country Road, Ethical Clothing Australia (ECA) and TOME. Sigrid McCarthy of ECA, Ramon Martin of TOME. You can watch the entire talk online. The panel offered up genuine insights about what is means for a fashion brand to be, or become, 'sustainable'. The message of the day? Sustainability is a journey. Sure, some of it's hard, and some of it will take awhile to figure out, but it's better to get started than to worry about being 'perfectly sustainable' (as if such a thing exists). Interestingly, this is what I tell people in my book and events - it's best to simply start somewhere. The perfect is the enemy of the good, they say, and it seems that this advice rings true whether we're talking about one person's lifestyle, or an entire fashion brand. New designers were given the advice to regularly talk about sustainability in order to remain connected to their goal. Encouragement to 'walk your talk', so to speak. Hand-in-hand with this advice is the importance of knowing why you're producing in this way. Branding has moved way beyond product now, customers buy into the "soul of your brand" and want to feel good on multiple levels when wearing your clothes. The panel also highlighted that you cannot rely on 'story' or 'branding' alone - design remains as important as ever. As Ramon from TOME put it, "The responsibility is ours. If you can put together a [successful] sustainable collection without telling your customer the story, you're a really great designer." Another message from the panel was the importance of collaboration. Ramon from TOME spoke of the importance of sharing sustainability ideas and information amongst other designers, and Lucy from Country Road explained that even though this can feel awkward - most of the time retailers and fashion brands do NOT wish to share supply chain secrets with one another - in order to truly change the way clothing is produced retailers and brands must come together, share knowledge, and collaborate. Finally, the audience was reminded that "design is a central figure in the supply chain process," and that designers have to decide they are going to change the system and create a supply chain that works for them and aligns with their sustainability values. When people look back in time, this is what fashion was in the early 21st Century. It wasn't about high hemlines or a miniskirt, it was about changing the way we make clothes. 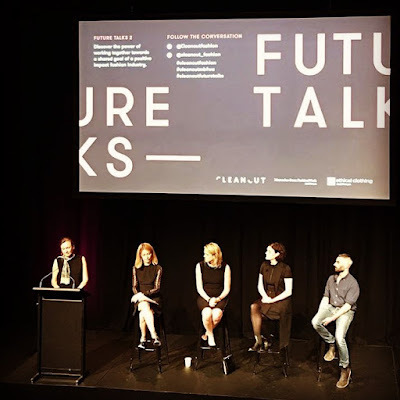 Were you at the Clean Cut Future Talks 2? What did you take note of? What would you ask the panel if you could?